On Thursday, May 28th, more than 1,248 students, parents and educators traveled to the Aqua Turf Club in Plantsville for the 31st Annual CAS Scholar-Leader Banquet. Two hundred fifty-six middle school students from around the state were recognized for their achievement in the areas of scholarship and leadership. The evening began with a warm welcome from Master of Ceremonies Scott Gray, recently retired sportscaster from WTIC 1080 Radio. 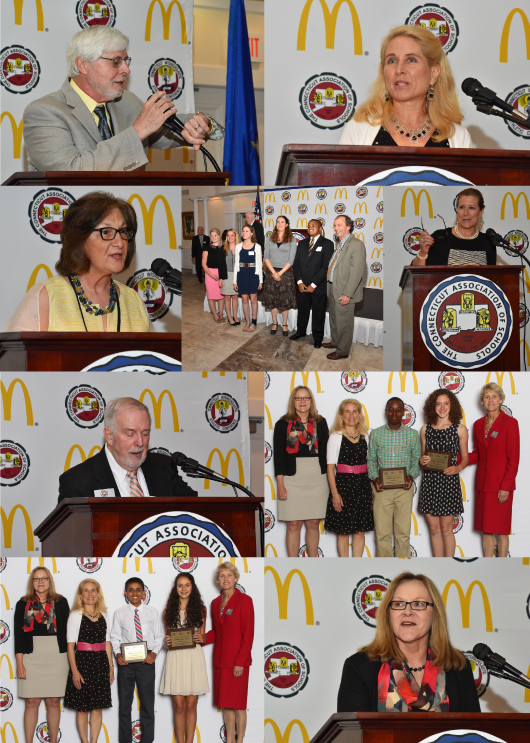 Guests then heard congratulatory messages from CAS President Donna Schilke, McDonald’s Corporation Vice President Cathy Martin, and Chief Talent Officer Dr. Sarah Barzee. The keynote speaker Catherine Freeman, Math Mastery Teacher at Sage Park Middle School and CAS 2014-2015 Middle Level Exemplary Educator, was introduced by her principal, Paul G. Cavaliere, Jr. In her remarks, Cay encouraged honorees to continue to achieve greatly and to be unafraid of making mistakes in the process. “New brain research has revealed some intriguing ideas,” said Cay. “Research shows that a brain actually grows and changes in response to challenge. We now know that in failing, in making mistakes and then learning from those mistakes, your brain actually grows new synapses – more even than if you had never made a mistake in the first place! So failing is growing, and when you fail, you learn.” Click here to read Cay’s remarks in their entirety. Or, watch the video below. Click here to download a banquet program containing a list of all of this year’s scholar-leaders.